With the International Association of Athletic Federations World Track and Field Tour concluded, athletes are now competing on the Asian Circuit looking to improve upon their seasons best performances and to earn additional prize incentives. Bahamian National women's 100 meter record holder and now veteran of the sport Chandra Sturrup, and National men's triple jump record holder Leevan 'Superman' Sands are set to compete at the Colourful Daegu Pre Championship Meeting in Daegu, Korea. The meet is set for Friday, September 25th with Sturrup facing off against the meet record holder American Lauryn Williams and the fastest woman in the World this year American Carmelita Jeter. 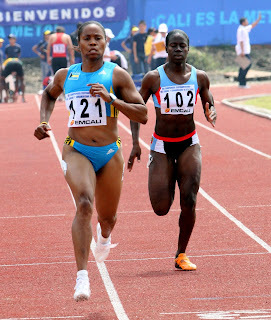 Former World 100 meter champion Jamaican Veronica Campbell-Brown is also set to compete. On the men's side, Sands is expected to receive tough competition against Brazil's Jardel Gregorio and from American Brandon Roulhac in the triple jump. "We are delighted to have some of the biggest superstars in Athletics, here for the 2009 Colorful Daegu Pre-Championships Meeting," exclaimed Kim Bum-Il, Mayor of Daegu Metropolitan City. "Their participation is a tremendous shot in the arm for boosting athletics in Korea." "The active support of such top athletes confirms the burgeoning reputation of the Colorful Daegu Meeting as one of the premier Athletics competitions in Asia," said Moon Dong-Hoo, vice president and secretary general of the Daegu 2011 World Championships. Moon, who is also the co-president of the Colorful Daegu Meeting Organizing Committee, added that an application has been submitted to the IAAF to include the annual Colorful Daegu Meeting in the new IAAF World Challenge format, which commences in 2010.